In spite of Naomasa’s death, building of the castle continued and the castle was finally completed at 1622 after 20 years construction. 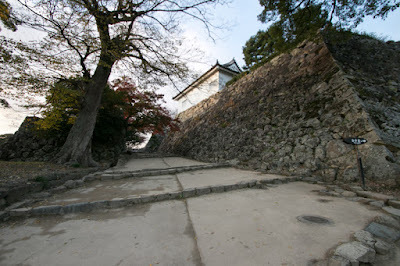 Whole area of hill was used as main areas, and there were two layor of water moats surrounded the hill. 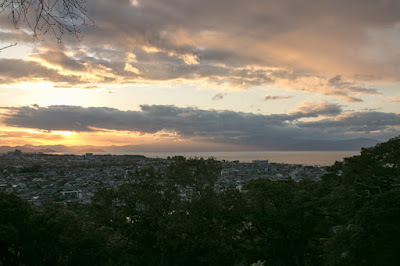 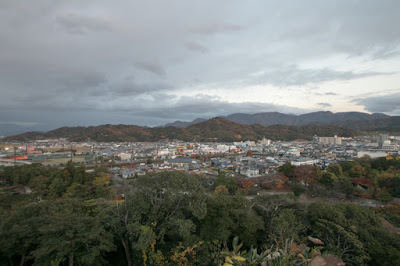 Hilltop area roughly consist of three areas, it means Kanenomaru (bell area) at southease edge, Honmaru (central area) at center and Nishinomaru (western area) and northwest edge. 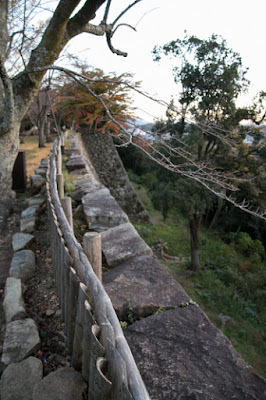 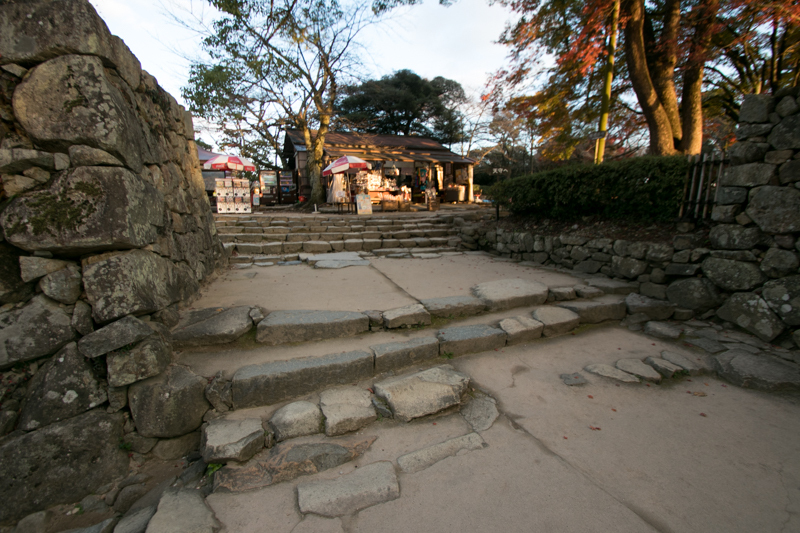 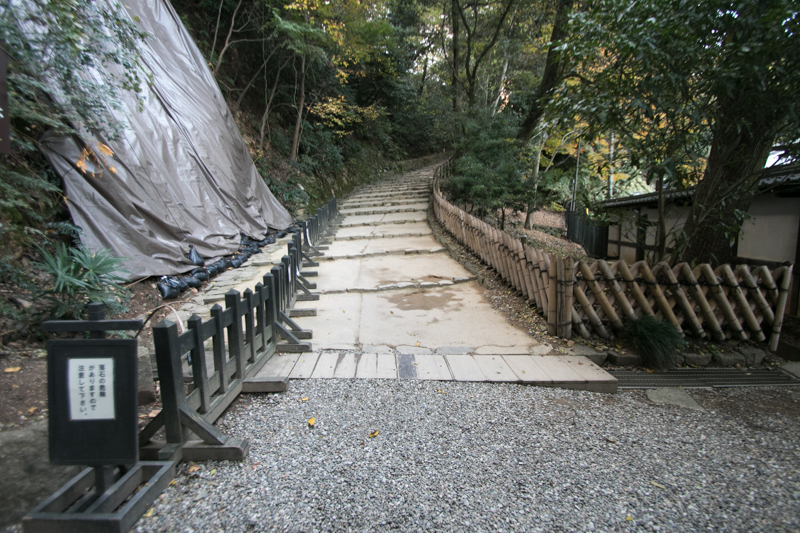 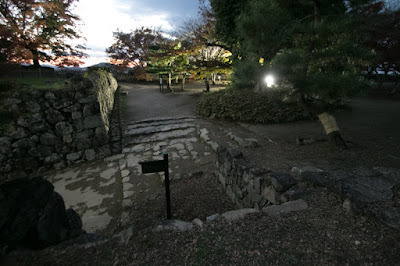 Main routes from hillside area are connected to dry moat dividing Honmaru and Kanenomaru, and visitors enters central area once climb up to Kanenomaru and pass the bridge to Honmaru. 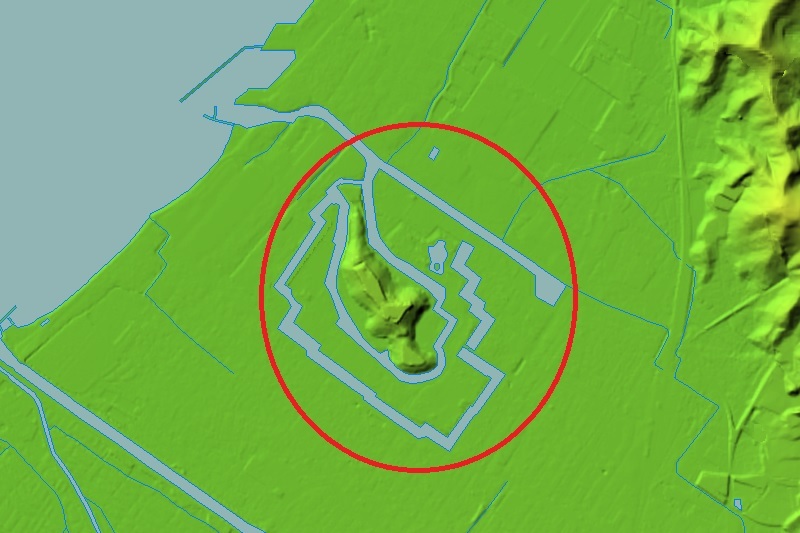 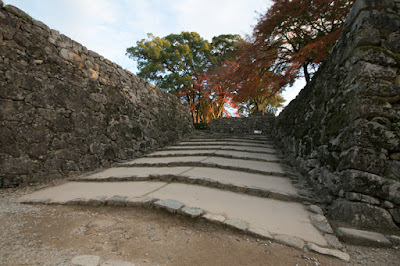 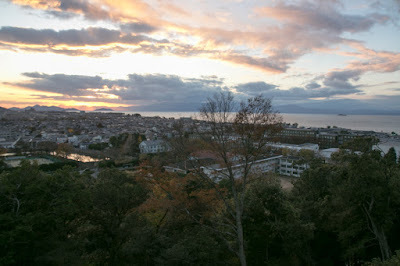 Hilltop area was surrounded by two layer of water moats. Inner moat directly enclosed the hill, and stone walls faces inner moat are not so high. 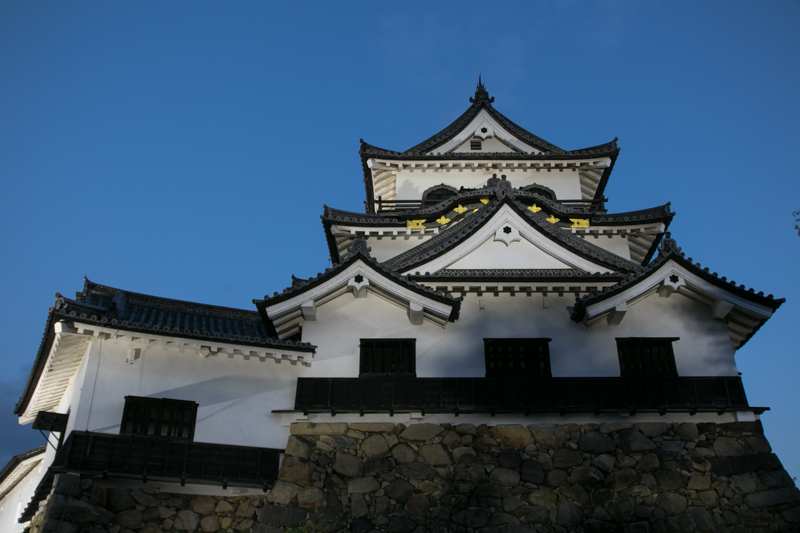 In the space between inner moats and hill, there were inner palace and armories. Outer moats guarded south front of the castle, and connected to the lake behind of the castle. 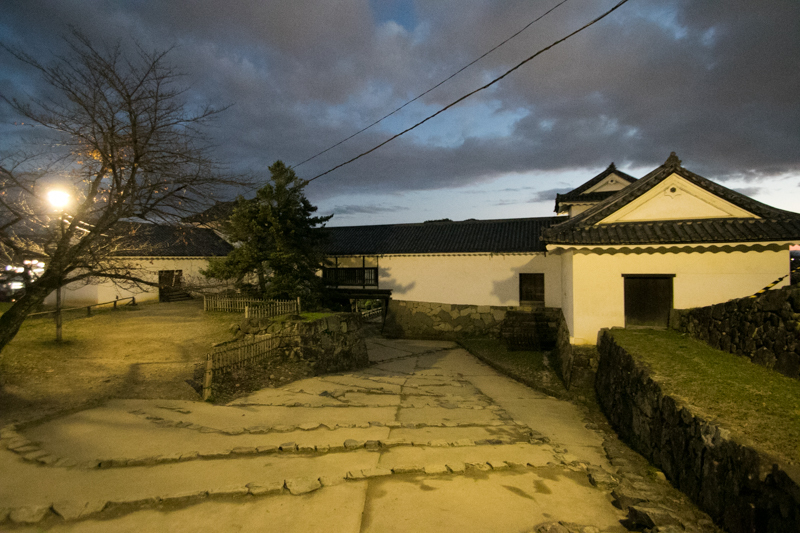 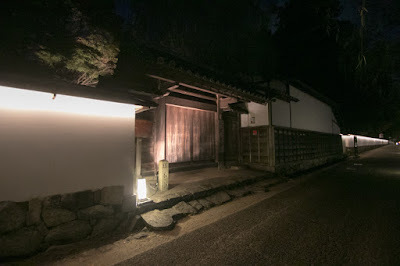 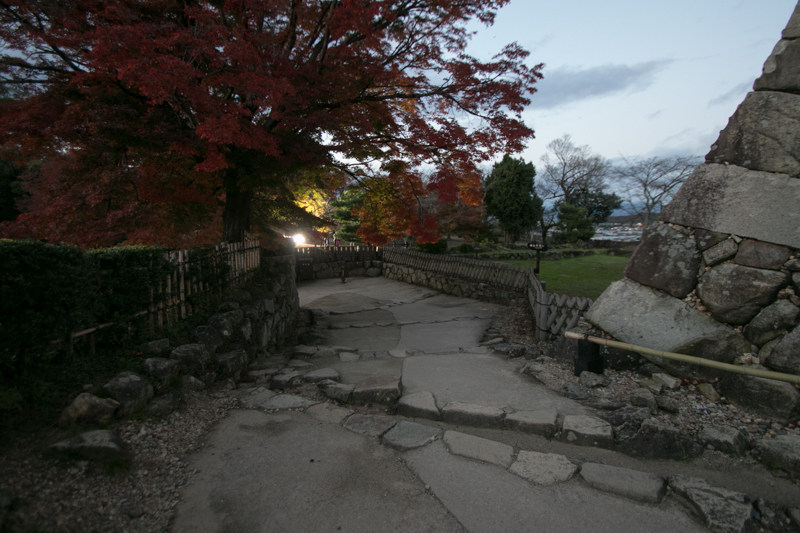 Originally front gate was Otemon gate facing westward, but later Sawaguchi gate facing southeast and connected to Nakasendo way became the main gate. Inside the outer moats, there were other palaces, offices or houses of upper class retainers. 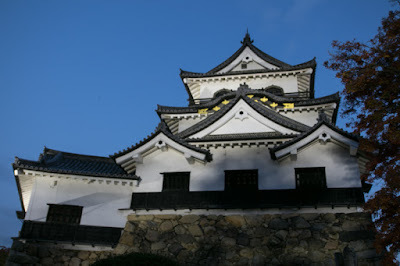 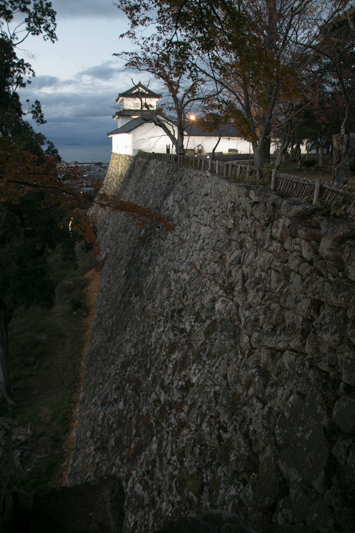 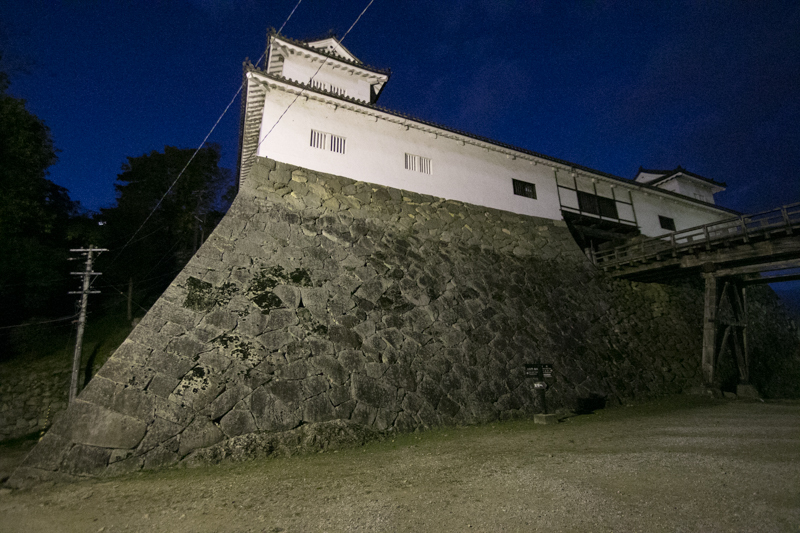 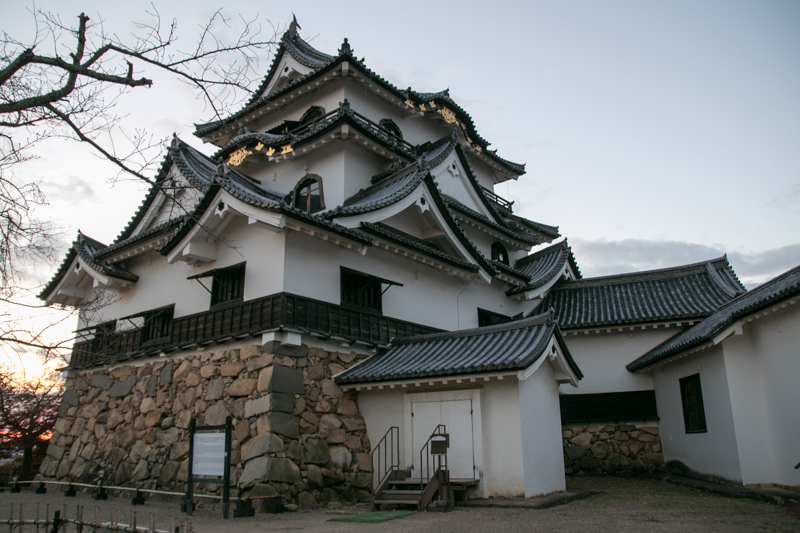 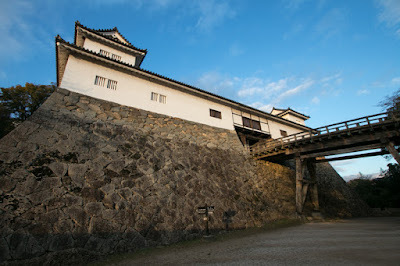 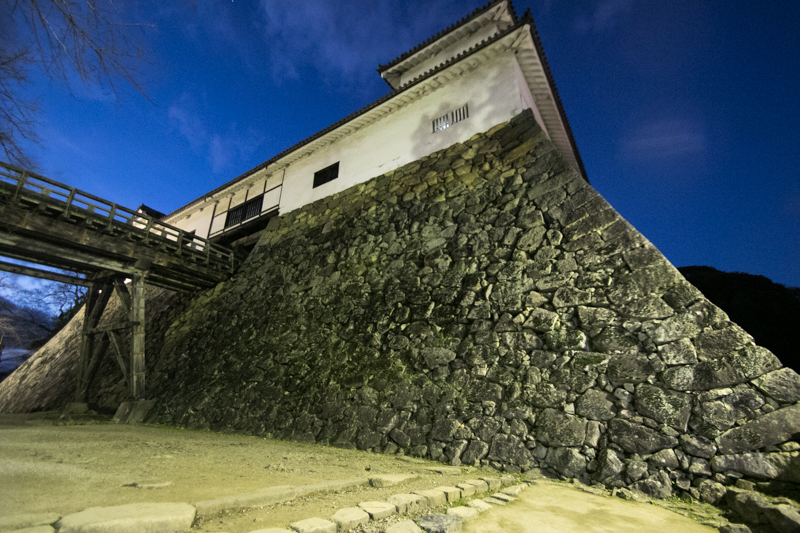 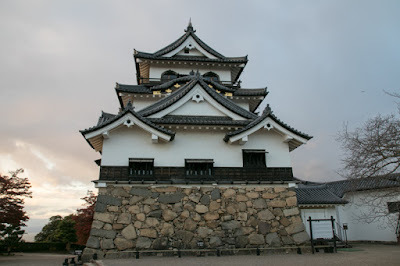 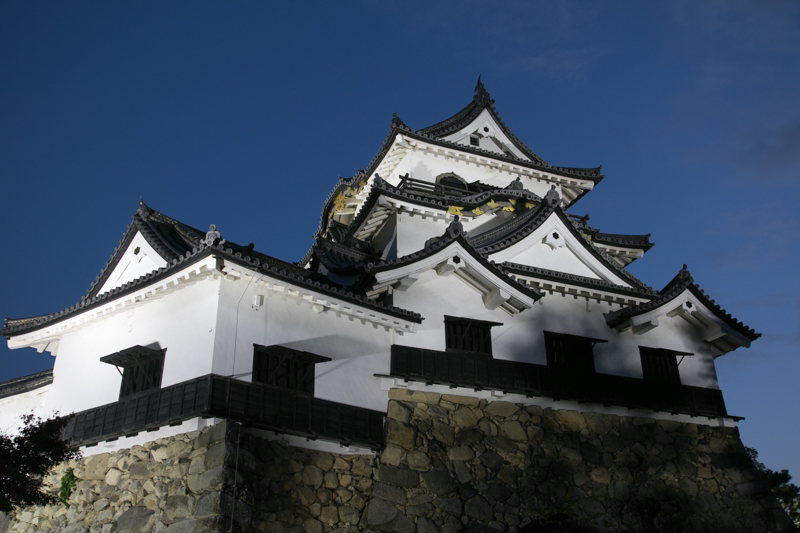 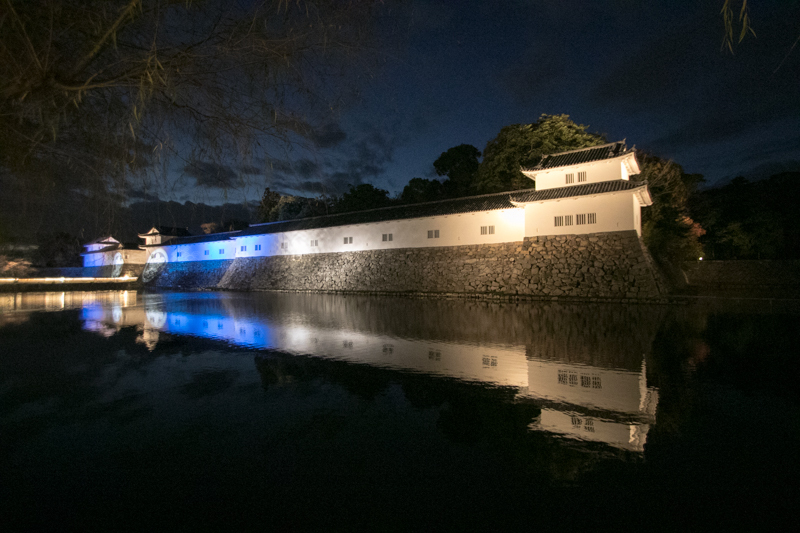 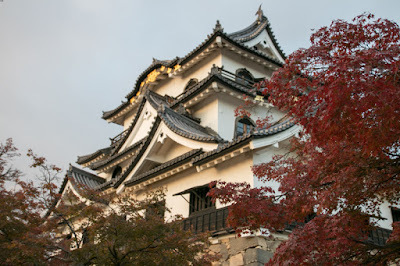 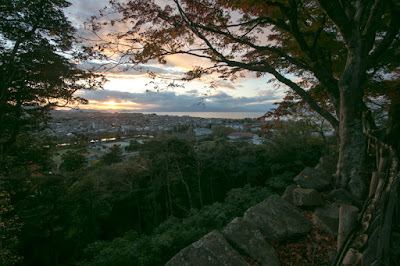 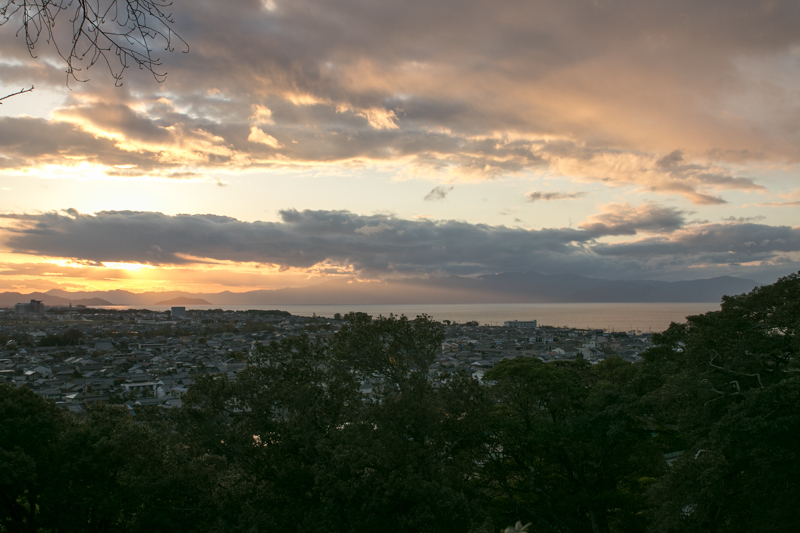 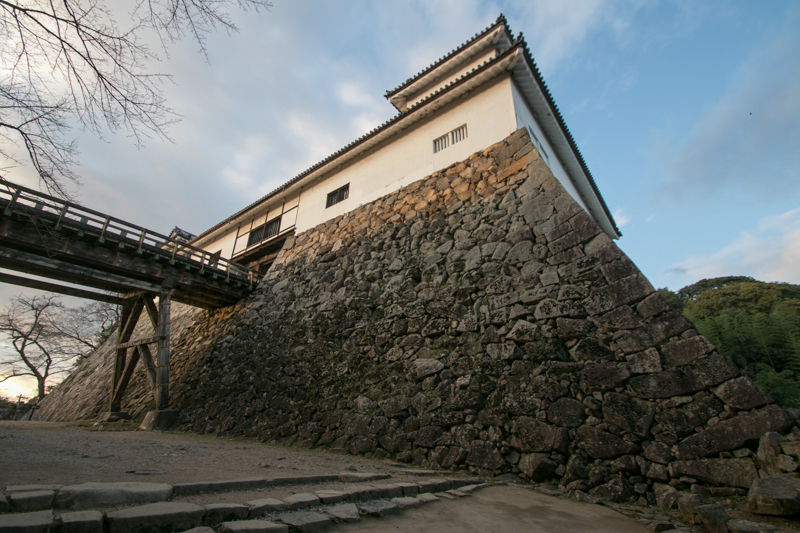 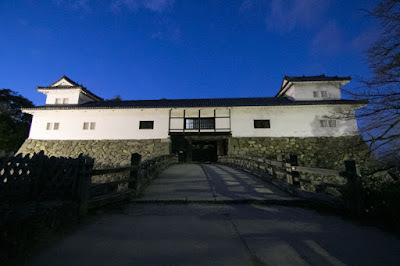 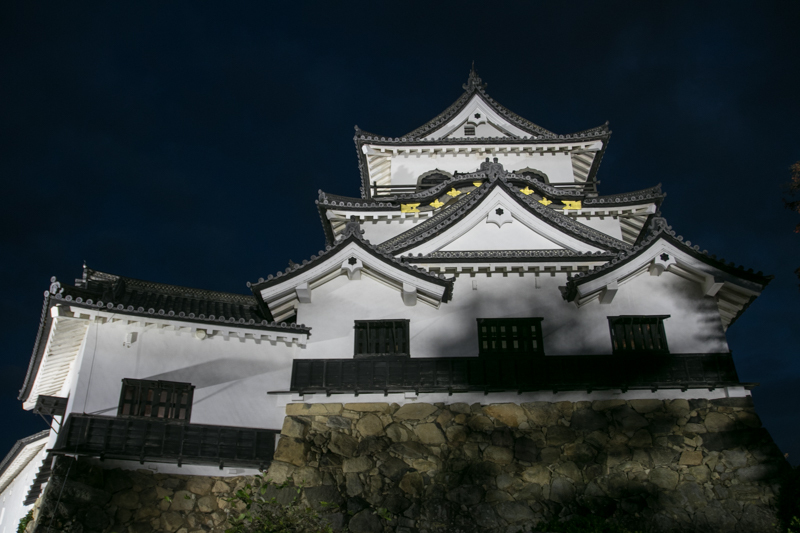 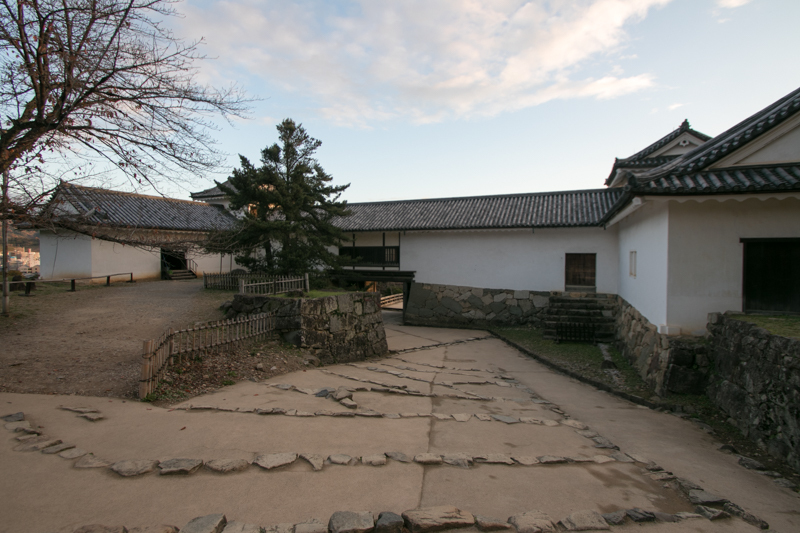 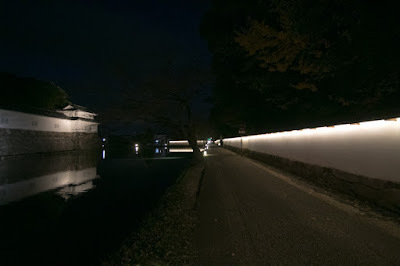 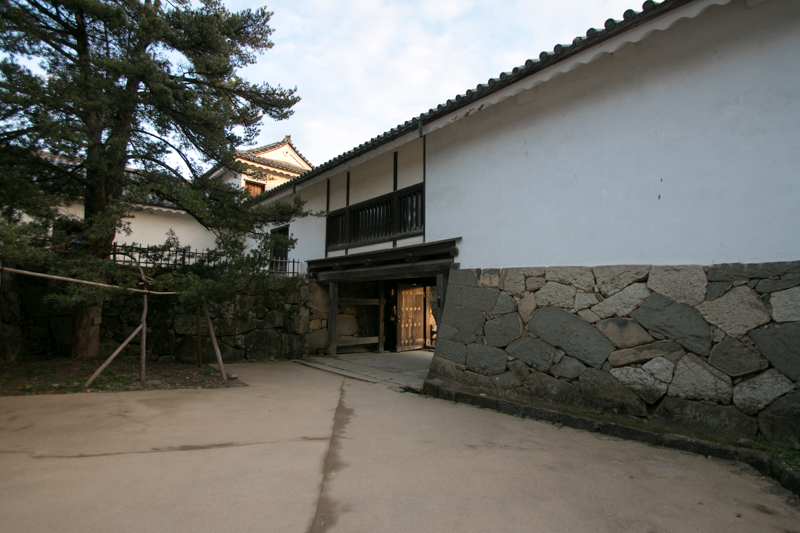 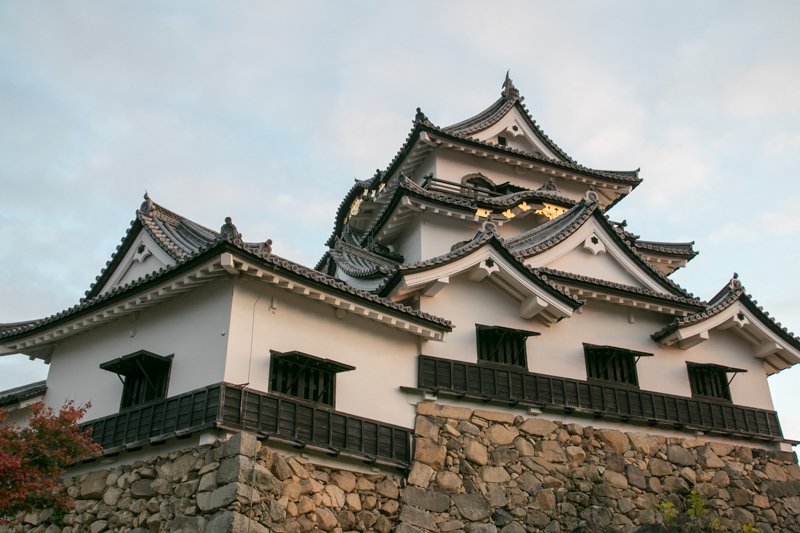 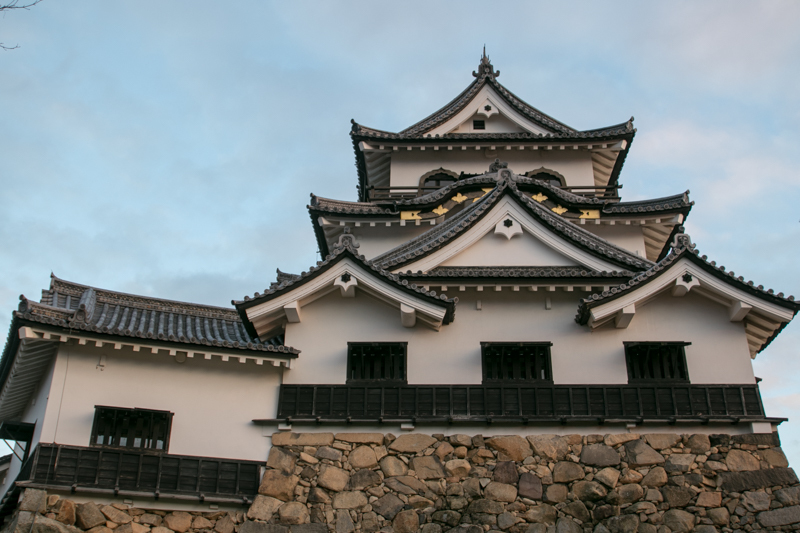 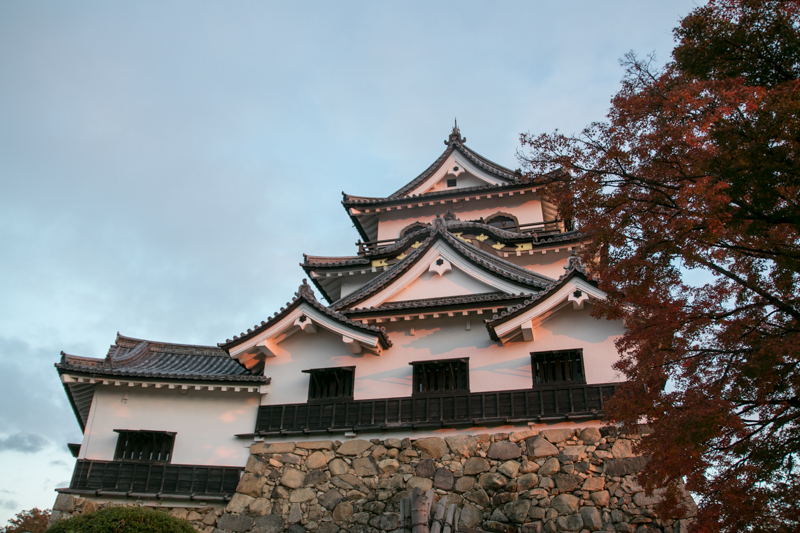 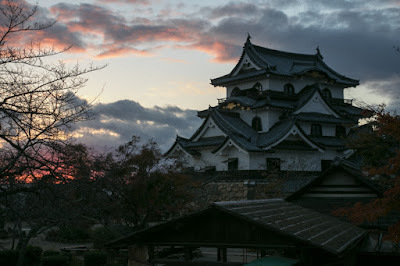 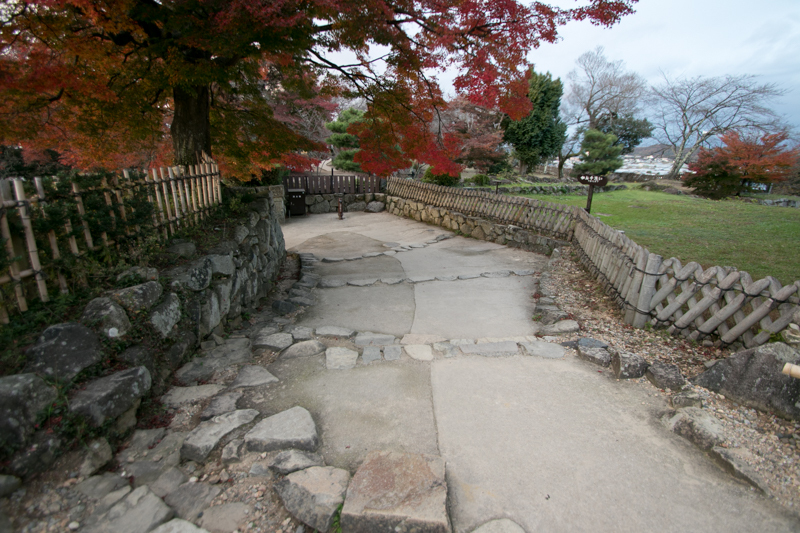 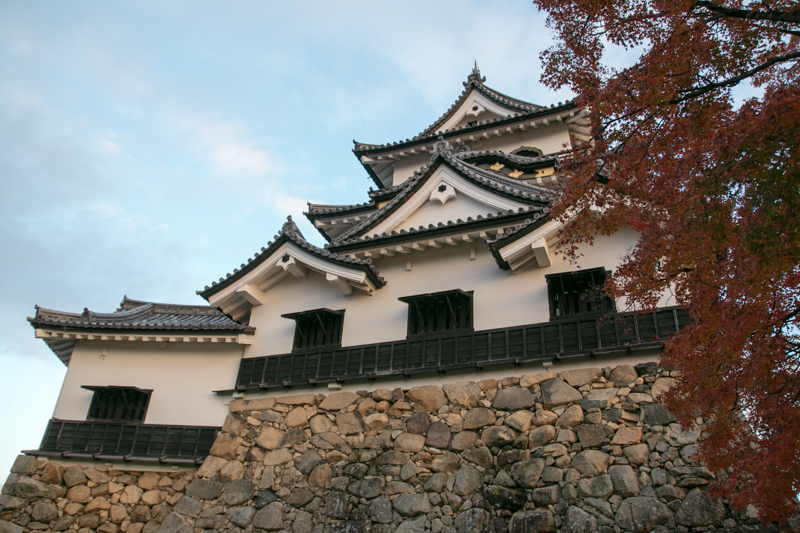 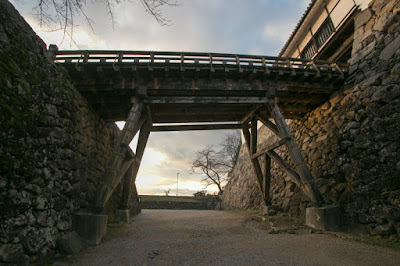 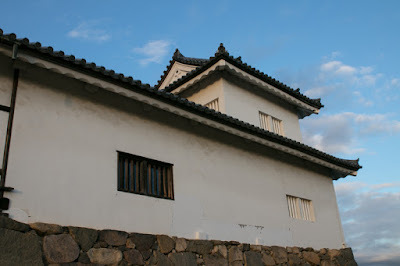 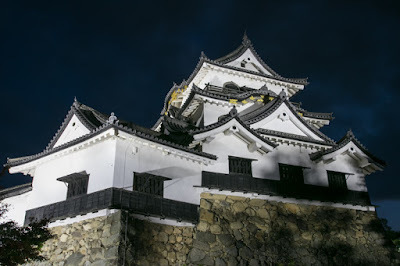 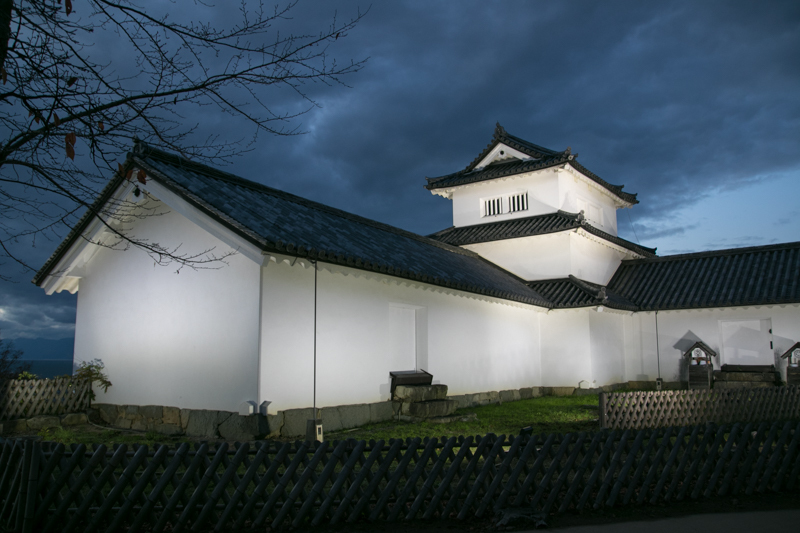 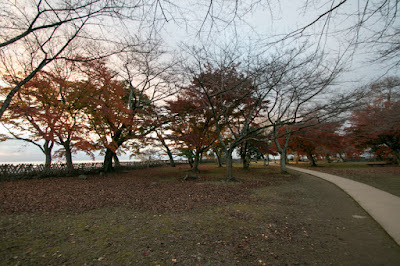 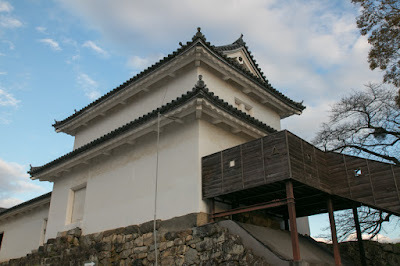 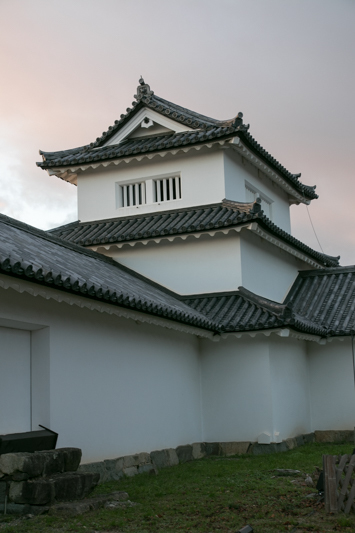 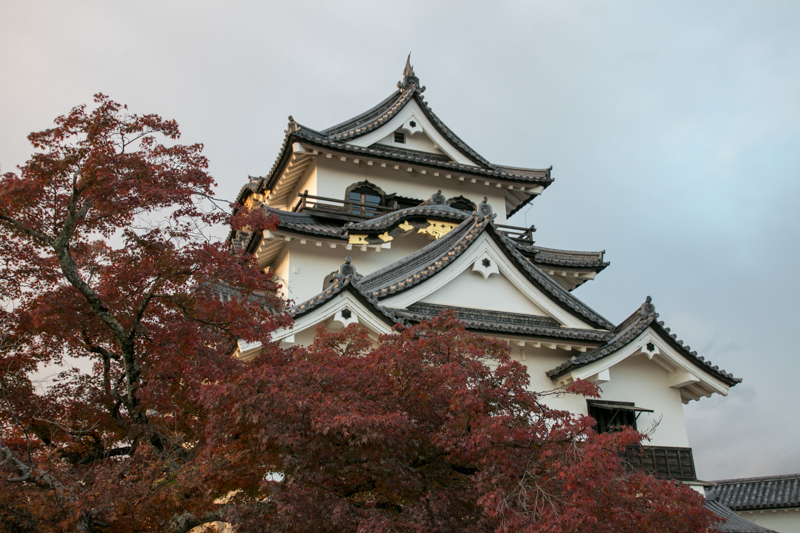 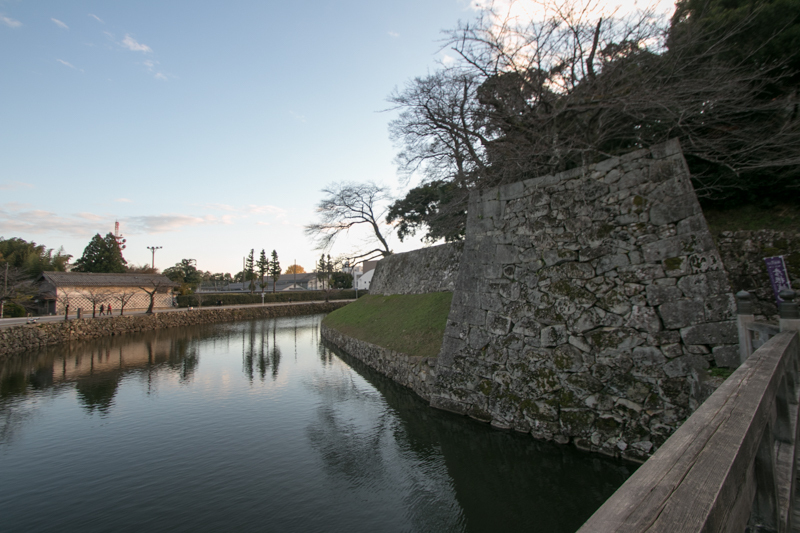 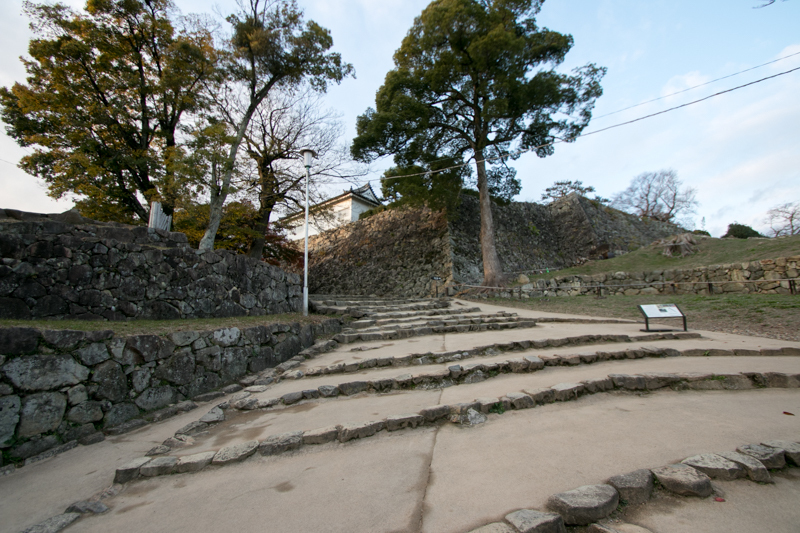 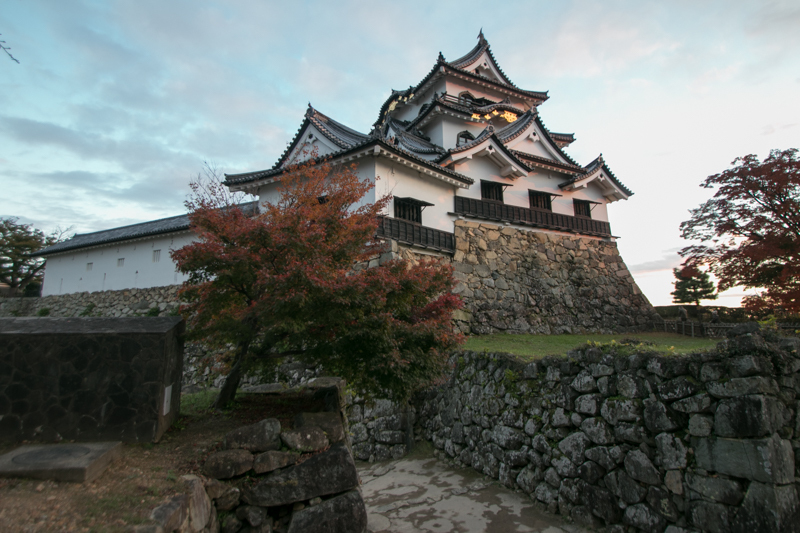 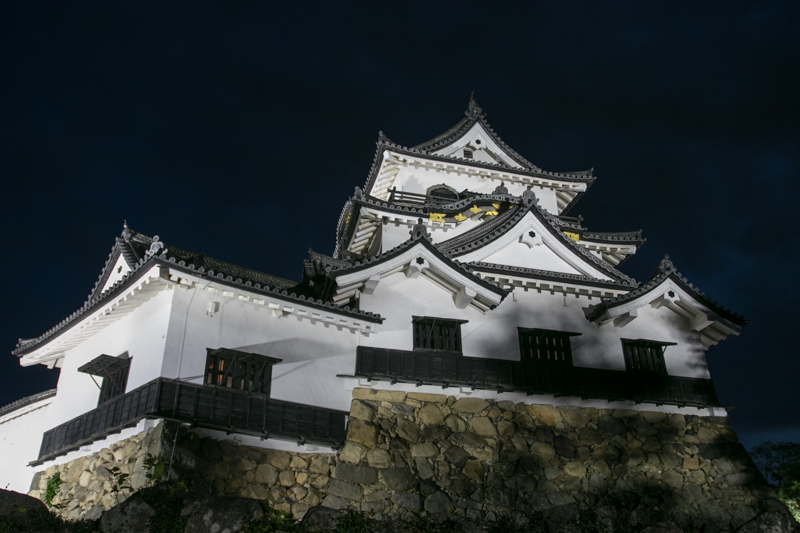 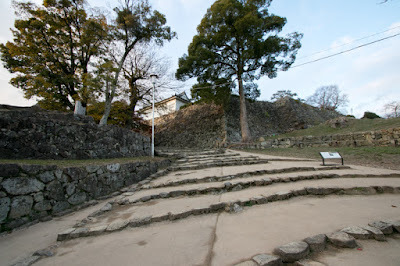 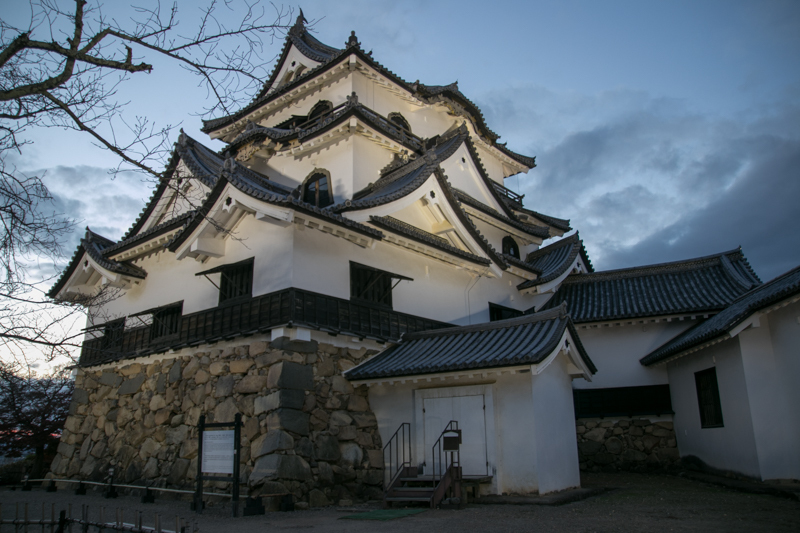 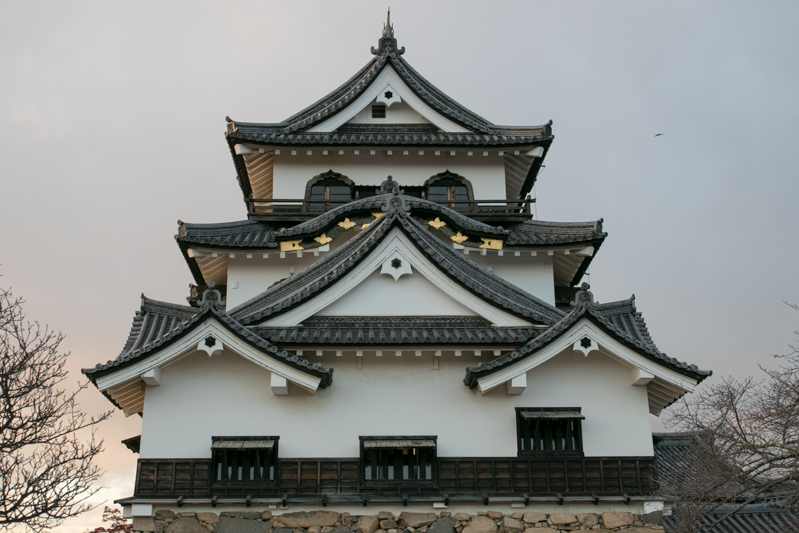 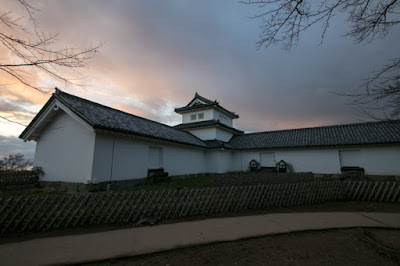 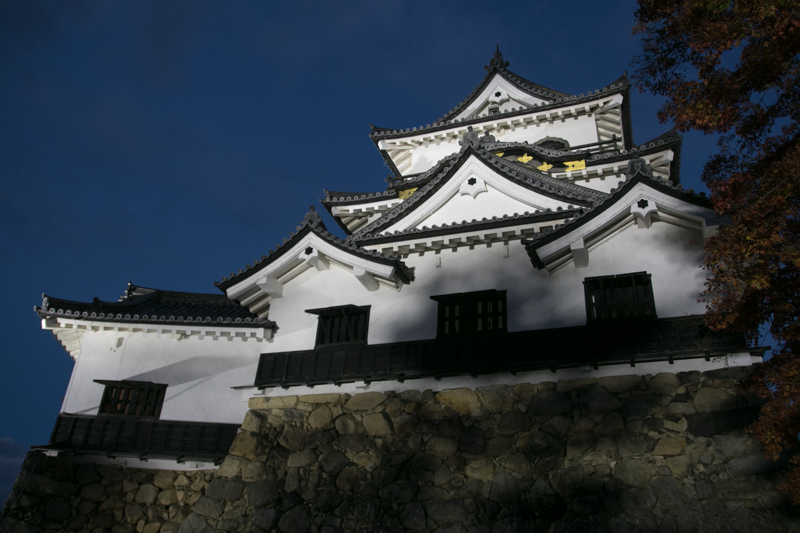 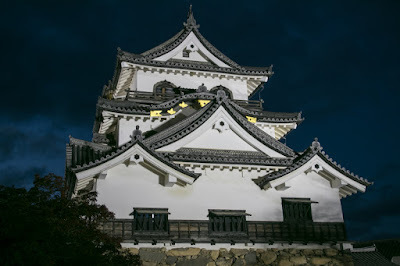 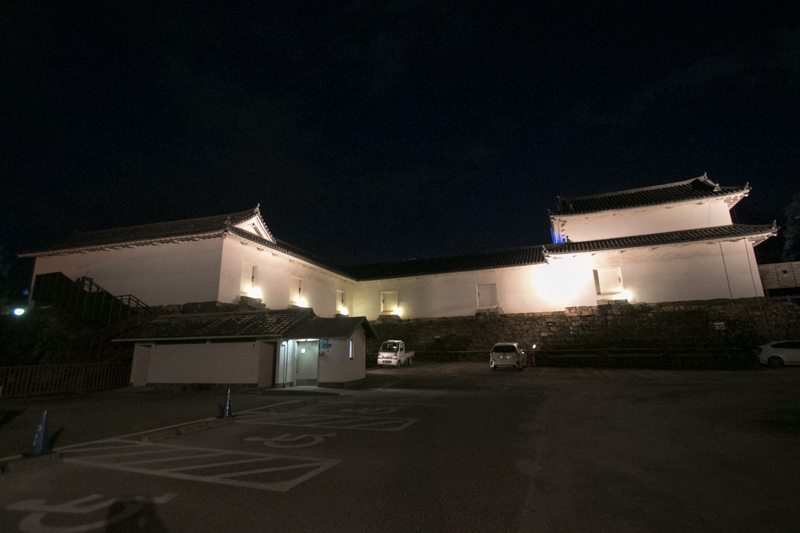 To save labor and time, many buildings of abolished castles were brought to Hikone castle. 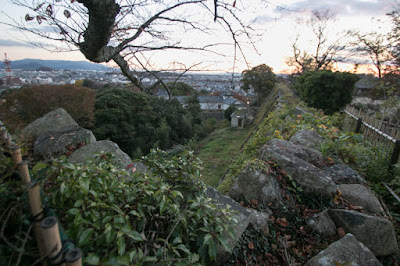 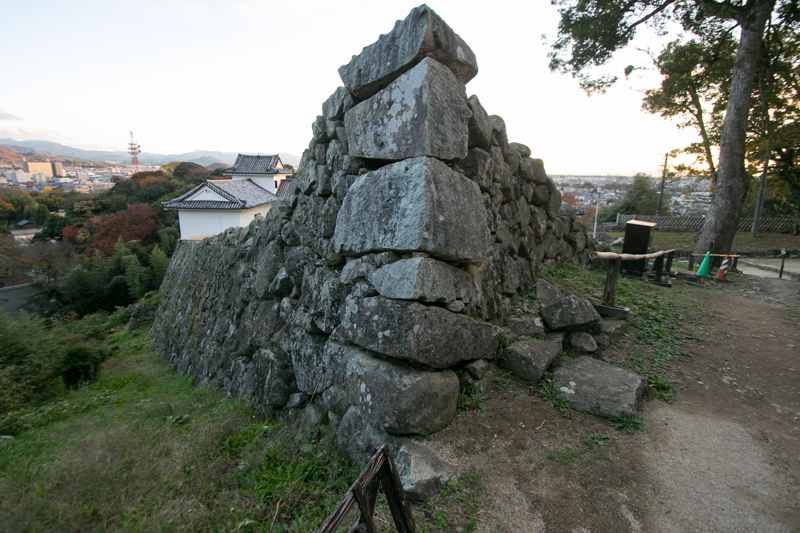 Due to this, there is a gap between stone walls built by latest technology and old lookiing buildings brought from existing castles. 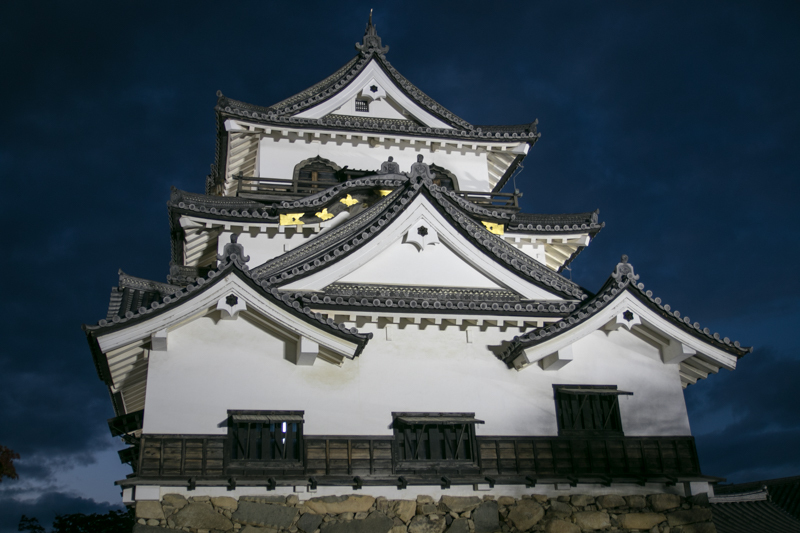 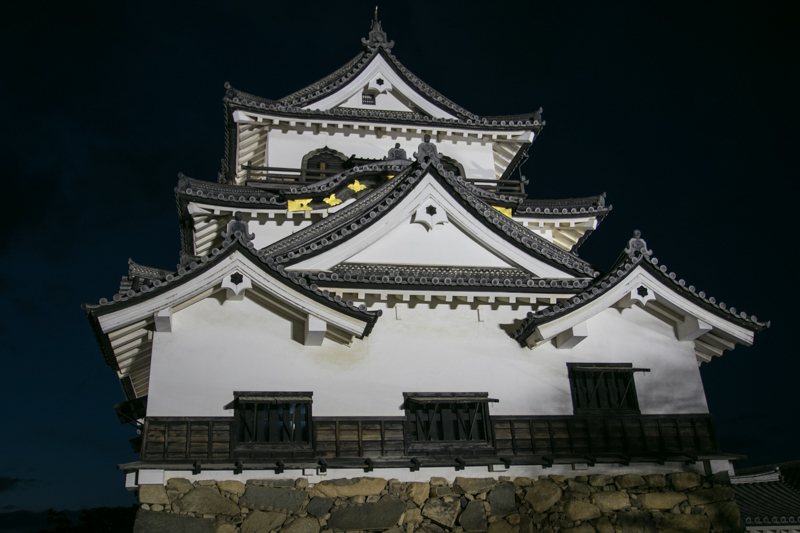 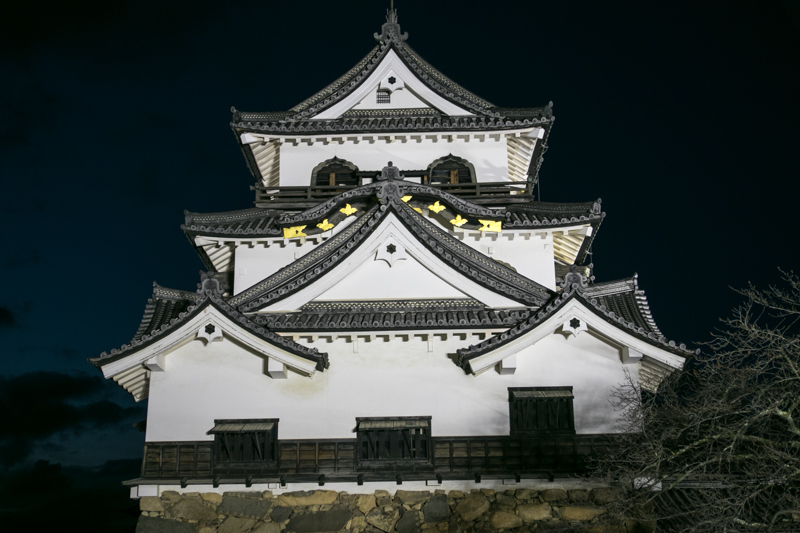 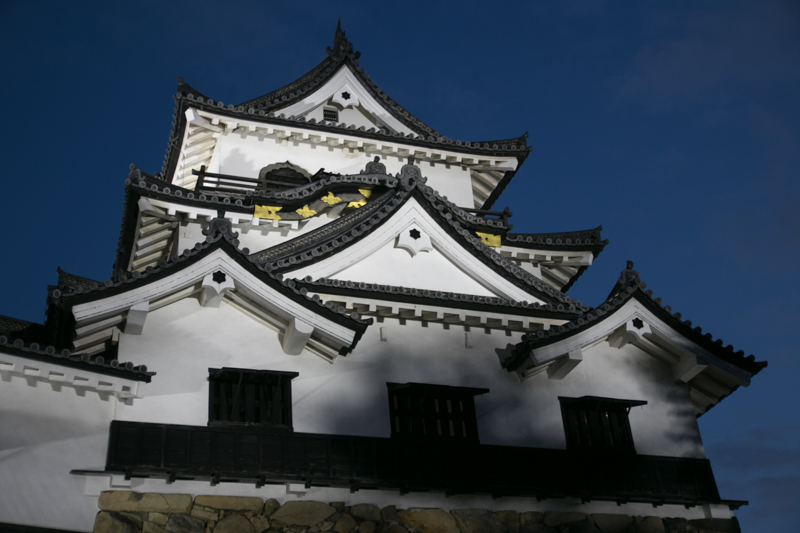 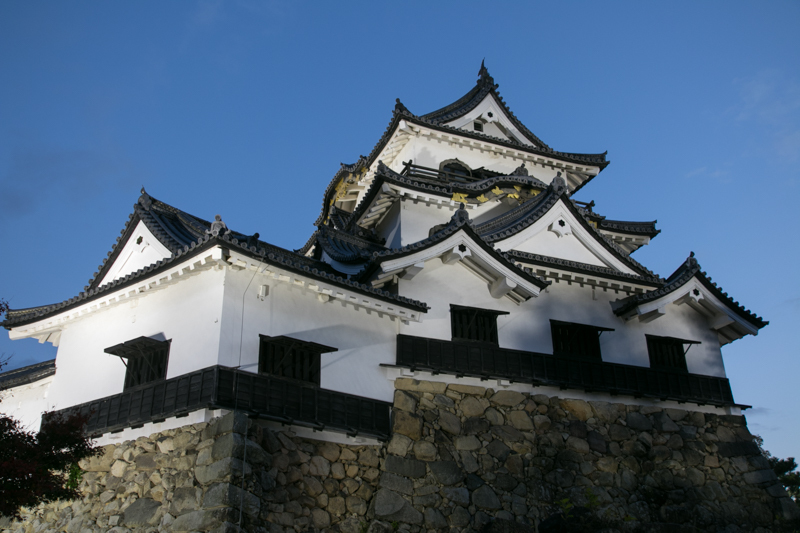 A three story three floor main tower (Tenshukaku) located at the center of the castle was said to be brought from Otsu castle. The exterior of tower is an old style equipped decoration roofs at each floors, and looks short and stout because it might be shorten from original five story tower. Tenbin yagura (Balance scale shaped turret) is a turret gate gurded the entrance into central area, and was transferred from Nagahama castle. It is a single layored turret gate having two layer tower at both side edge. Towers at each edge are not a decoraton but aimed at climbing routes from hillside area to dry moat in front of the gate. 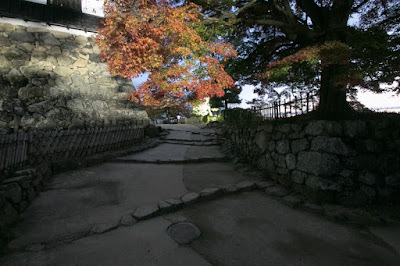 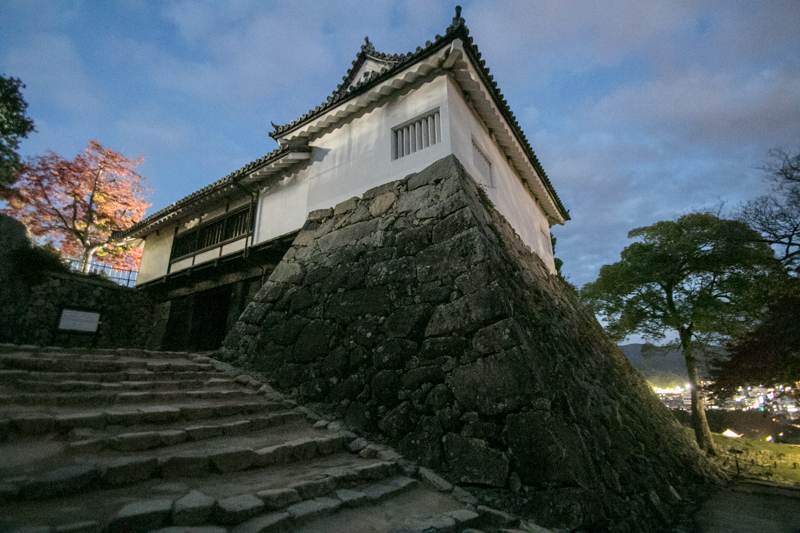 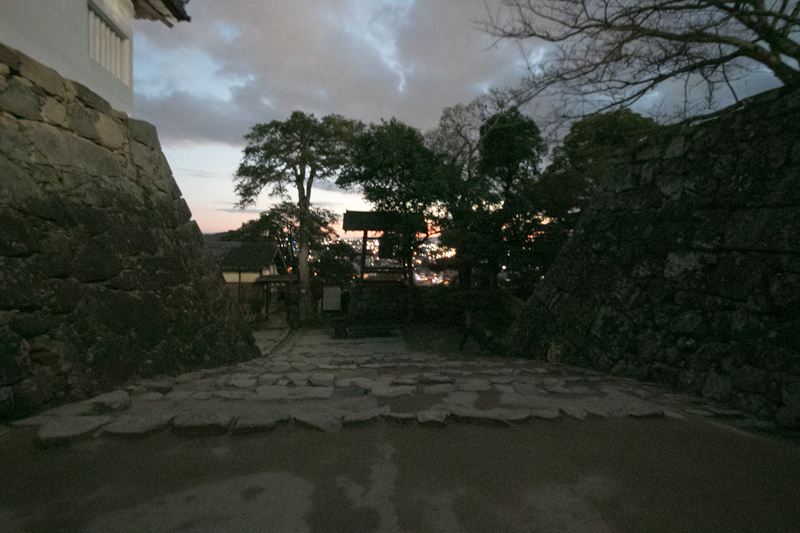 At the edge of Nishinomaru, there was a three story corner turret. 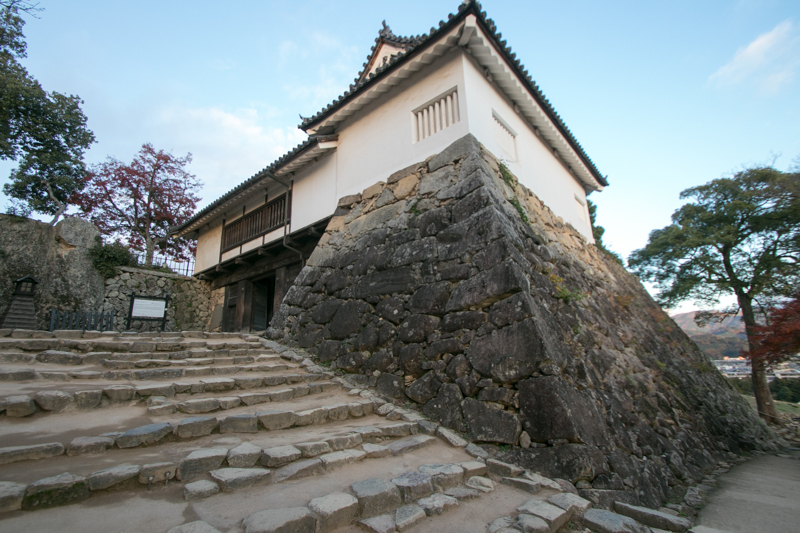 This is called as Nishinomaru Sanju Yagura (Three story turret at Nishinomaru), and was said to be moved from Odani castle. 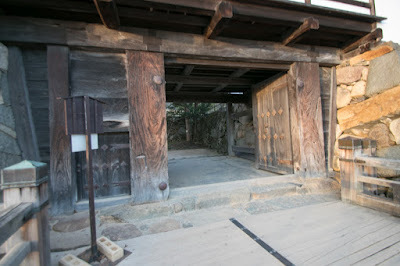 Number of floor is same as main tower, but this tower is slim and simple design without any decoration. 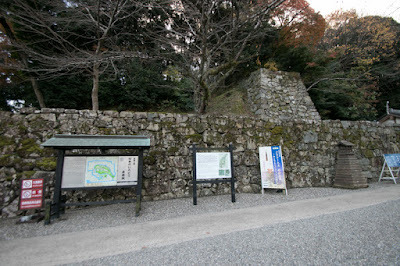 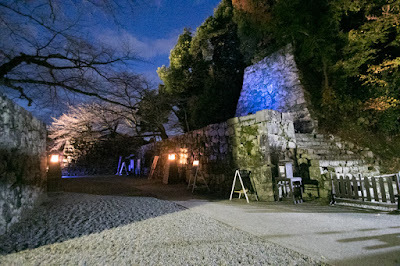 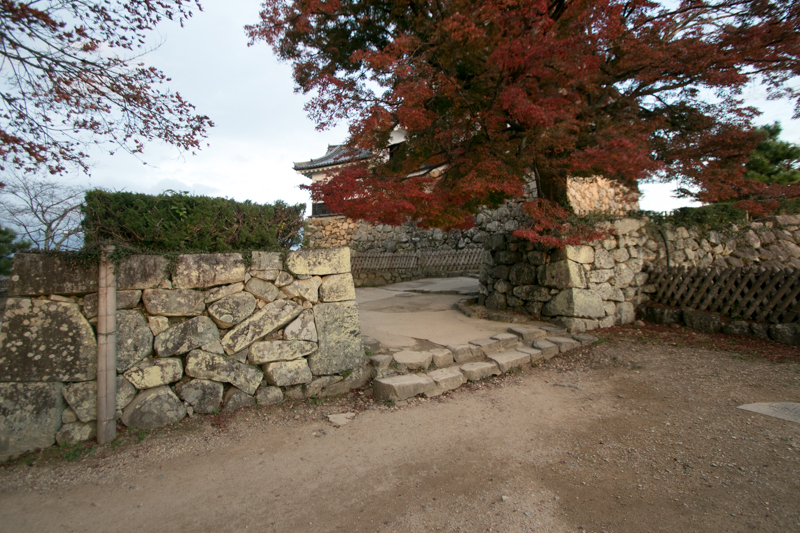 On the stone wall guarding Sagaguchi gate, Saguchi Tamon Yagura (Barrack turret at Sagaguchi gate) remains. 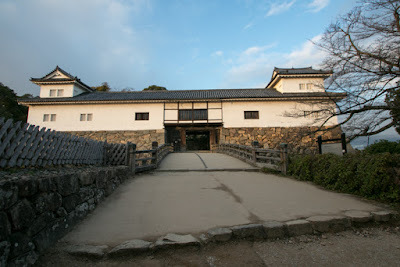 As a main gate Sawaguchi gate was a strictly guarded composite gate consists of inner turret gate, outer gate and connectiing barrack turret on both side of the gate. But gate building and another barrack turret were lost and only one barrack turret survived (Another barrack turret was reconstructed later). 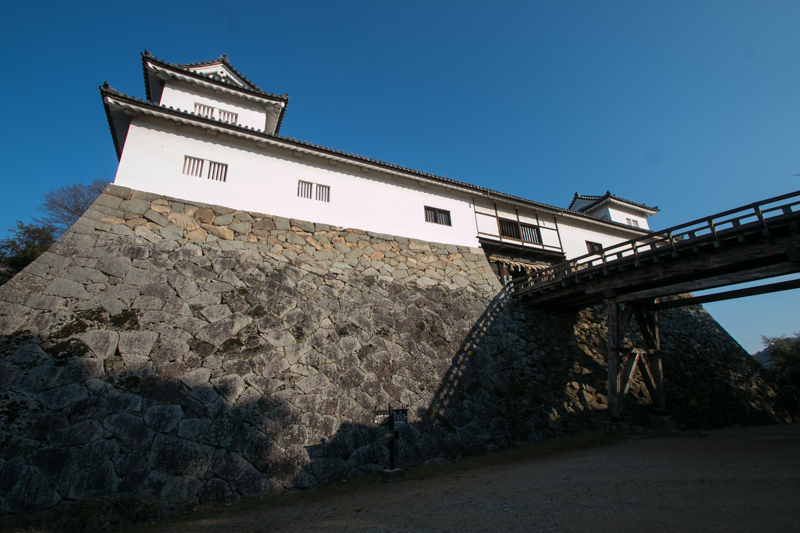 Facing the front side of the castle, this turret has thick wall to prevent guns and cannons, and also loophalls to shot attaking enemies. Other than them, there exist stud house of the castle, and several gates of the house of important retainers remain inside or outside of the castle. 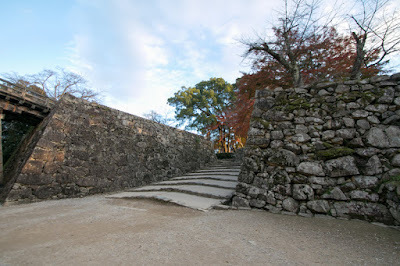 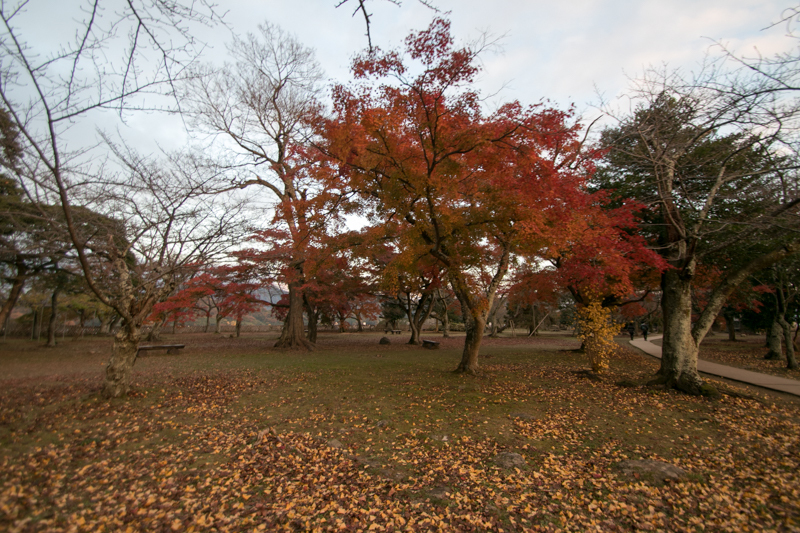 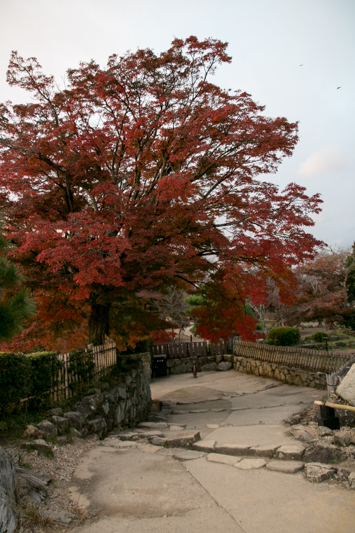 Besides, a beautiful Japanese garden named “Genkyuen” is located inside the castle. Western world in 1857. 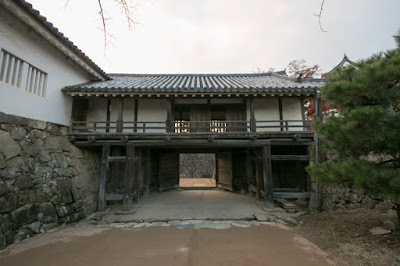 But as Emperor at that time opposed to opening and Naosuke oppressed many antiforeign royalist, he was assassinated by activiests of Mito domain outside of Sakuradamon gate of Edo castle in 1860, seven years before the end of Edo shogunate. 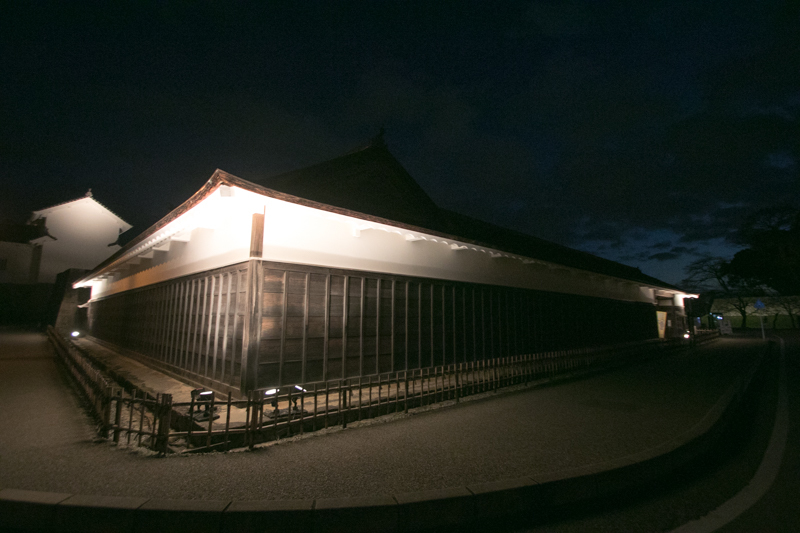 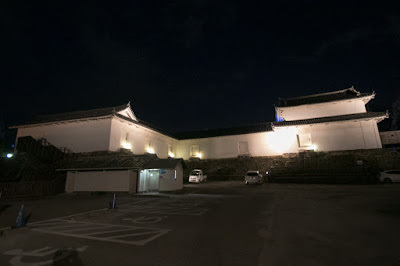 Subsequent to Meiji revolution, even though Ii clan was an important retainer of old government and enemy of revolutionalists, buildings of the castle were kept for some unknown reasons. 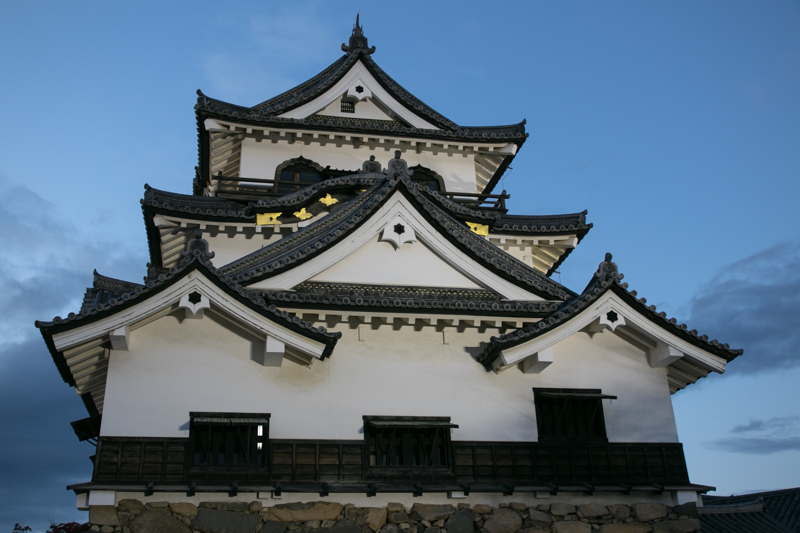 As Hikone city escaped the target of bombing during WW2, there remain many old buildings at castle town along with castle itself. Even if not large, stylish builngs having range of variety on the hill please the eye of us. 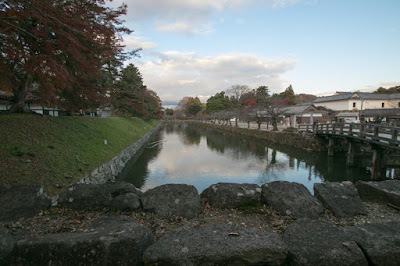 15 minutes walk from JR West Tokaido Honsen line Hikone station. 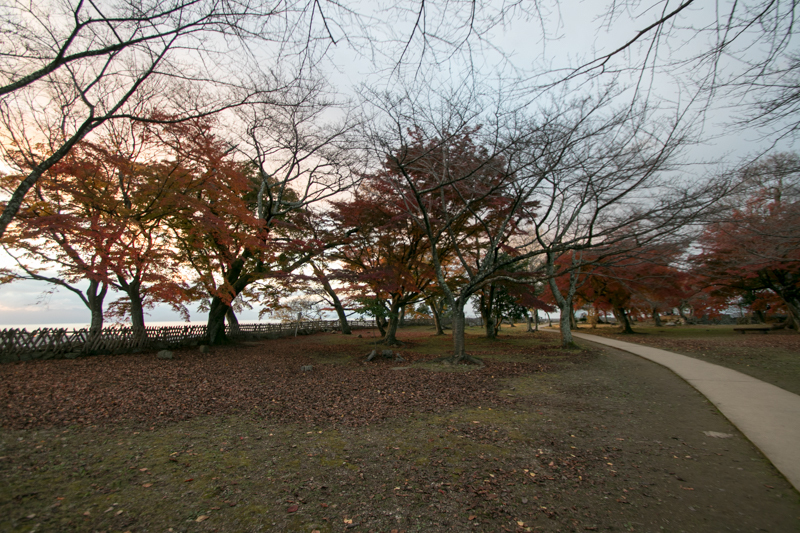 15 minutes drive from Meishin Expressway Hikone interchange.